Winter weather requires hot, comforting food. Your idea of winter comfort food might include a pile of poutine. 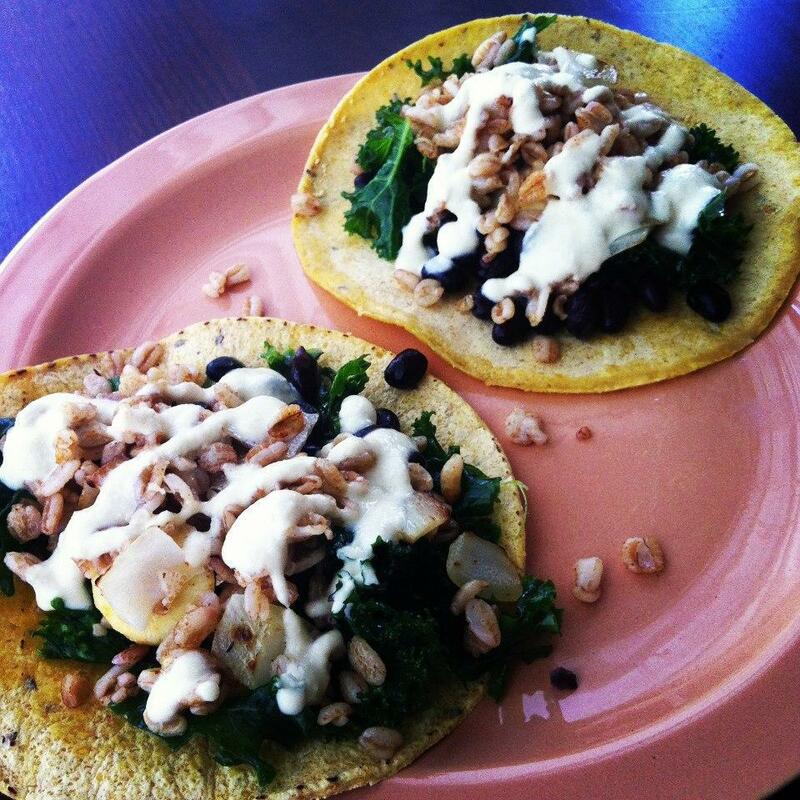 But I argue that you can layer the comfort you crave with the nutrients your body needs. 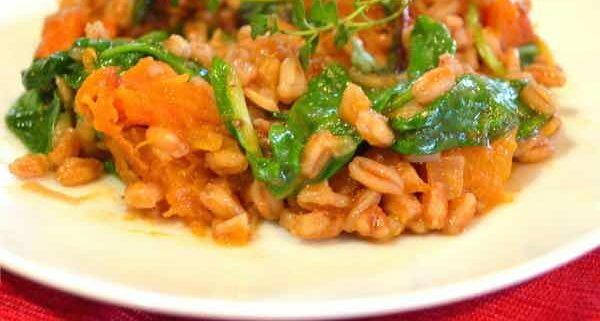 This Butternut Farrotto is a variation on a recipe by Chef Annette Tomei, who is also one of our editors and our Wine of the Week columnist. 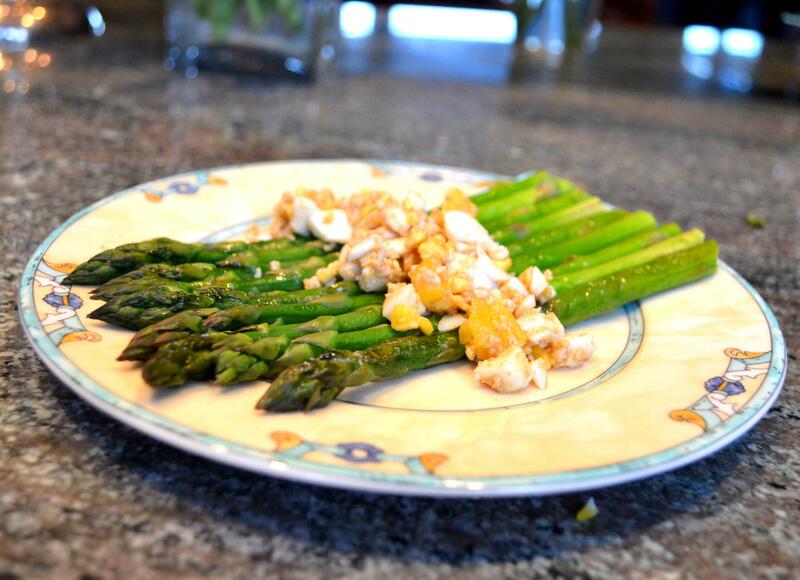 If you’ve never experienced Farrotto, you might be wondering about the orgins of this dish. 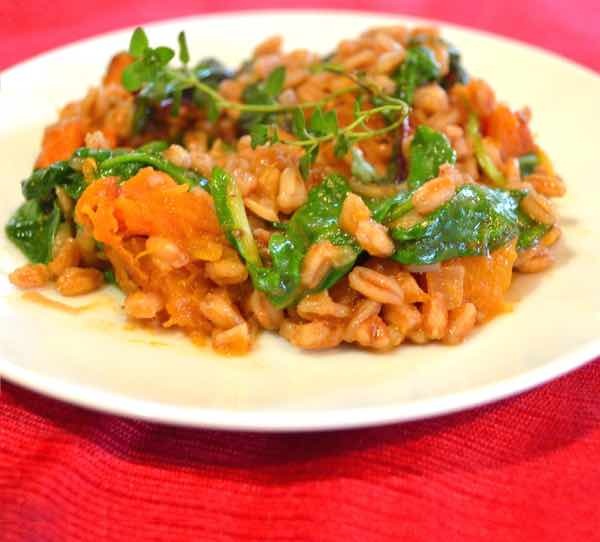 Farrotto is simply a variation on risotto using the hearty grain farro in place of arborio rice. Thus, the name. 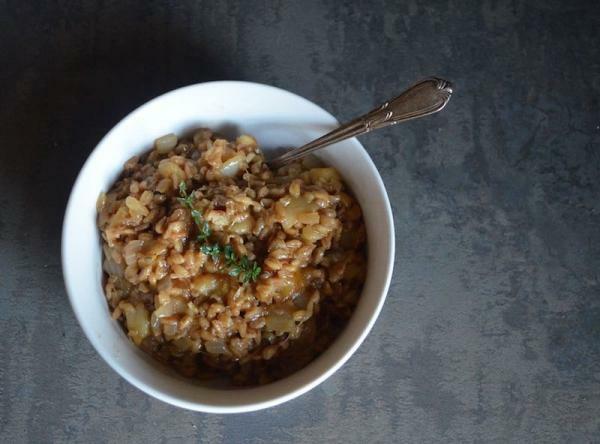 Farro plus risotto equals farrotto! The resulting risotto has a different flavor and texture than what you get from arborio. Farro is a firm, whole grain with a mildly nutty flavor. This recipe calls for toasting it in the oven before adding it to the risotto pot. 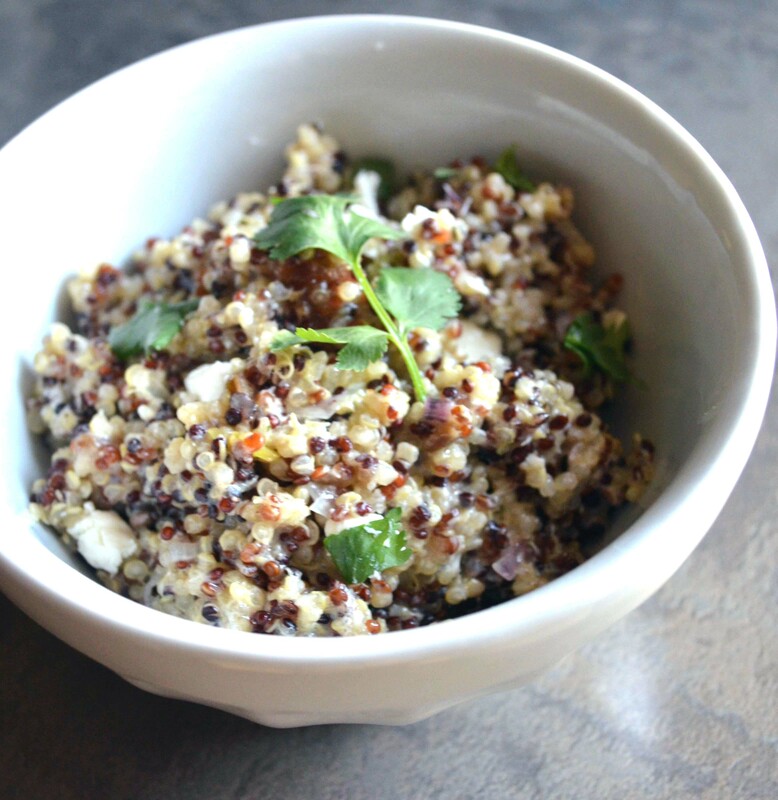 This augments the grain’s natural flavors and helps individualize the grains and prevent the final dish from going gummy. Farro is sold at most health food and specialty food stores. 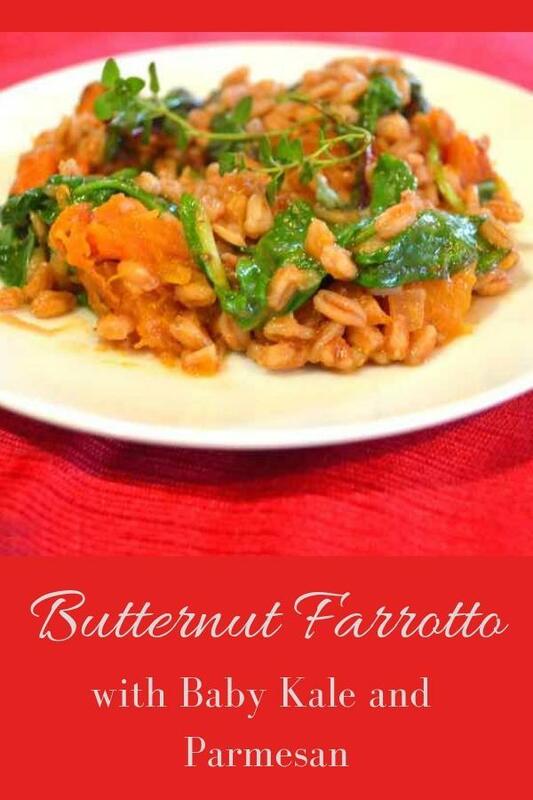 But if you can’t find farro locally, do not substitute another grain to make this Butternut Farrotto. You can always order it online. Bob’s Red Mill carries a reliable product. This Butternut Farrotto recipe is loaded with libido-boosting ingredients like kale, thyme and barley. 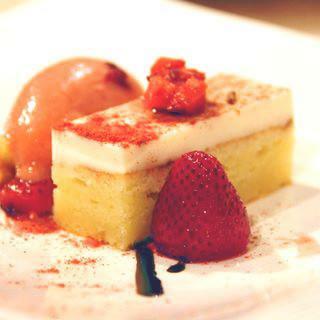 But it also includes decadent ingredients like Parmesan–an aphrodisiac in its own right. And don’t worry, there’s also plenty of wine and butter to give the dish that indulgence you crave. I prefer to roast my butternut in the toaster oven to cut down on time and conserve energy. Of course, on a really cold day, firing up the oven to slow roast the squash can bring welcomed warmth to your kitchen. And then, on those rough days when I really need an extra boost of creamy goodness, I grab an extra fist full of Parmesan and stir until the mixture is creamy and almost stretchy with fibers of tangy, Italian cheese. Then I add in the kale and feel like I’m doing something virtuous. A creamy version of butternut squash risotto made with farro. Toast the farro in the oven for 8-10 minutes until it begins to turn golden and smell toasted. Toss the butternut with oil and roast in the 425 degree oven for 30-35 minutes. Melt the butter in a large sauce pan over medium heat. Add the garlic, shallot and thyme and cook for 3-4 minutes, until shallot is translucent. Add the white wine and turn heat to medium high. Cook the wine down by half, scraping any shallot and garlic bits down from the sides of the pan. Add in the toasted farro and 1/2 cup of the vegetable stock. Cook, stirring, until the vegetable stock is absorbed. Repeat, adding the stock 1/2 cup at a time until there is only 1/2 cup of stock left. This should take about 20 minutes, give or take 4-5. Add the last 1/2 cup of stock along with the roasted butternut, stirring until all the liquid is absorbed. Stir in the Parmesan and kale before serving, then season with salt to taste. You can garnish with fresh thyme sprigs if desired. Try a New Wine–trying new things is liberating!